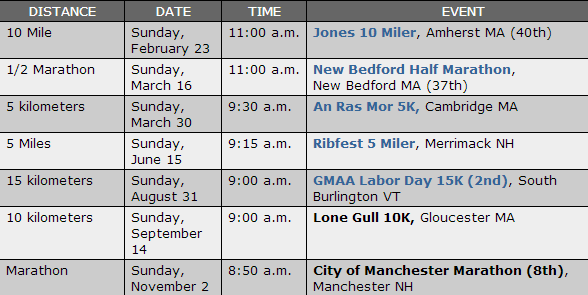 The 2014 Road Racing Grand Prix officially kicks off tomorrow, February 23rd, with the Jones 10 Miler in Amherst, MA. The challenging race along scenic, hilly rural roads offers a total of $9,250 in prize money. $1,750 will be awarded to top individuals, $2,500 in age group prizes (no double dipping) and $5,000 for top teams. The event is rooted in New England history, having been founded by USATF-NE President Tom Derderian in 1975 as a tune-up race before the Boston Marathon. In fact, as the race website notes, “Bill Rodgers won Jones 10 Miler the first year it was held and used the race as a training run for his first Boston Marathon victory.” Past results for the race can be viewed here. If you’re still interested in racing and have yet to sign up, it’s not too late. Race-day registration begins at 9:00 am at Amherst Regional High School. The full 2014 Grand Prix schedule is outlined below, but there are two races taking place just next month that we want to make you aware of. The 37th Annual New Bedford Half Marathon will be held on March 16, with registration closing on March 1. Next up in the calendar is the An Ras Mor 5k in Cambridge, the shortest race distance in the series. Held on March 30, runners can enter up until race day; however, entry fees go up $5 after March 9. USATF members will receive a discount on the registration fee. Please note that there are are no special steps needed to do so — simply select the “USATF member” category and know your 2014 individual USATF member number, which can be looked up here. There are a few notable changes to the Grand Prix Guidelines this year. Men’s and Women’s 70+ age group teams will be included in the scoring, as well as women’s 65-69 and 70+ individual age groups. Additionally, individuals winning their age group will begin with 10 points and those in second, third, etc, will be scored one point less for the top ten regardless of how many finishers are in the age category. Also in 2014, runners aging into a new category as individuals will still receive points in the age group in which they began the series. Their name will also appear in their new age group and they can accumulate points there as well. Be sure to visit our website for the latest Grand Prix standings following each event. In 2013 Grand Prix standings, B.A.A. and Whirlaway Racing team took the men’s and women’s open team titles respectively, with Sean Duncan of WMDP and Stephanie Reilly of Team RUN coming in as the the top open individuals. To view the winning Grand Prix teams since 1986, check out that list on our website here. Which teams and individual runners will take home the top Grand Prix titles and prize packages this year? This entry was posted by Jenny Gardynski on February 22, 2014 at 4:58 pm, and is filed under Track & Field. Follow any responses to this post through RSS 2.0.Both comments and pings are currently closed.